Montreal, Canada, February 20-21 The Canadian Maritime Industries Association's (CMIA) 41st Annual Technical Conference will be held at Montreal's Queen Elizabeth Hotel on February 20-21, 1989. "As a result of the resounding success of the Canadian Shipbuilding & Offshore Exhibition, we have decided to include CSOE '89 on the program for our 1989 conference," said CMIA president J.Y. Clarke. "This added feature has resulted in a tremendous interest in the conference, the largest technical marine c o n f e r e n c e held in Canada. CSOE'89 will be a major component of the conference." Mr. Clarke pointed out that the technical conference's open sessions, which begin at 9 a.m. on February 21, will be presented in two adjacent rooms, the Jolliet Room and Marquette Room. Some of the papers listed in the preliminary program include: "Design Development and First Experience with the Bergen Diesel Type B Medium Speed Engine," by L.M. Nerheim, Bergen Diesel A.S.; "Diesel Engines in Naval Applications," by H. Pleimling, Deutz MWM; "Trump Noise Control," by K. McKeever, Pratt & Whitney Canada Inc.; and "Construction and Project Management of Icebreaker Oden," by B-G Renbourg, GVA Canada, and J. Falkman and G.
CSOE '89 will be located on the convention floor opposite the technical conference rooms. CSOE'89 will help bring together many sectors of the marine industry, including electronics, communications, navigation and electric equipment suppliers, shipbuilders and ship repairers, diesel engine and propulsion equipment manufacturers, and other marine systems, services and parts companies. Exhibition hours will be 2 p.m. to 6 p.m. on Monday, February 20, and 10 a.m. to 5 p.m., on Tuesday, February 21. Mr. Clarke noted that the 1988 technical conference and exhibition attracted well over 900 persons from across Canada and around the world, including international media and government officials. For further information about the conference and exhibition, as well as CMIA, contact: Mrs. Joy Mac- Pherson, secretary/treasurer, Canadian Maritime Industries Association, P.O. Box 1429, Station B, Ottawa, Ontario, Canada KIP 5R4; telephone: (613) 232-7127; telex: 053-4848; fax: (613) 232-2490. TECHNICAL PRESENTATIONS Jolliet Room "Integrated Logistic Support—A Canadian Approach," by B. Hough. AMTEK Management. "Design Development and First Experience with the Bergen Diesel Type B Medium Speed Engine," by L.M. Nerheim, Bergen Diesel A.S.
"Diesel Engines in Naval Applications," H.
"The Pressurized Light Water Reactor— A Well Optimized Marine Propulsion Power Source," by P. Gumley, F.N. McDonnell and R. Humphries, Atomic Energy of Canada Ltd.
"Trump 1000-KW Diesel Generator," by G. Munro, Pratt & Whitney Canada Inc.
"Trump Noise Control," by K. McKeever Pratt & Whitney Canada Inc.
"Practical Applications in CADD for 3-D Machinery Space Design and Modular Outfitting," by D.J. Fong and P. Eng, RDS Engineering. 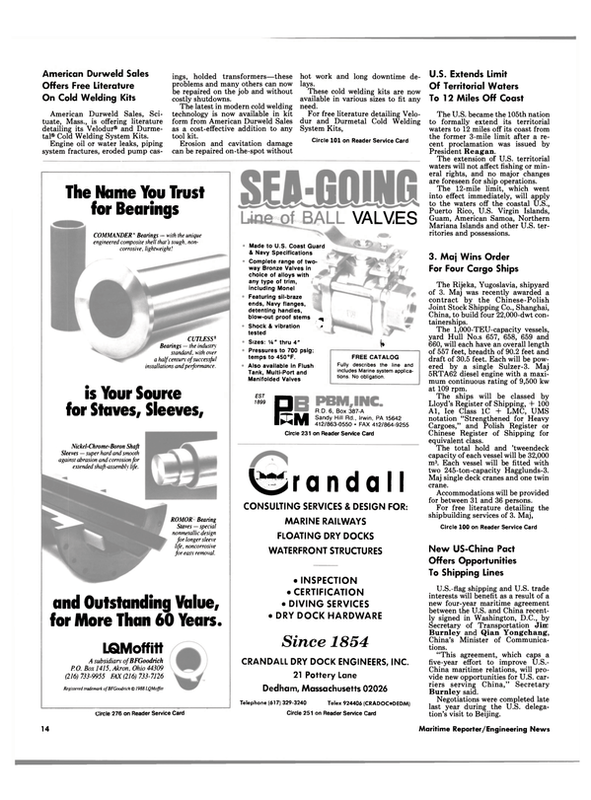 "Pump Application to Ships," by C.
McNeil, Energy, Mines & Resources. Marquette Room "The Hatchcoverless Containership—A New Concept," by T.R. Fisher, Advance Ship Design Pty., Ltd.
"Fracture Control for Steel Marine Structures." by W.R. Tyson, M. Braid and V. Scepanovic. "Construction and Project Management of Icebreaker Oden," by B-G Renbourg, GVA Canada, and J. Falkman and G. Lilijestrom. "Investigation of the Seakeeping Qualities of a Canadian Forces Research Vessel," by A.F. Aboulazm. Marine Institute. "Ship Resistance in Pack Ice," by A.F. Aboulazm. Marine Institute, and D. Muggeridge. "Propulsion Tests on the Class 4 Icebreaker M.V. Kalvik," by P.L. Semery. "Why Welding Certification," by D.E.H. Reynolds and P. Eng. Canadian Welding Bureau. "Electric Propulsion Systems—The Way of the Future," by D. Peters. General Electric Canada Inc.